Often referred to as “Washington State” to distinguish from the U.S. capital, Washington is located in the Pacific Northwest region of the United States to the north of Oregon and west of Idaho. Western Washington is mild because of the warm currents coming off the North Pacific Ocean. This area has frequent cloud cover, considerable fog and drizzles. Summers are much sunnier, yet still mild. Seattle is the largest city of the Pacific Northwest region. Tacoma is a port city with several good museums downtown. Washington state is a great place for seafood, with salmon in particular being a specialty. A few major attractions include Columbia River Gorge, Mount Rainier National Park, Mount St. Helens National Volcanic Monument, Olympic National Park (a UNESCO World Heritage Site) and the city of Spokane. To explore most of Washington (outside of main cities), you will generally need a car because there is very little public transportation, especially to more remote locations. For more information, view the cultural learning guid below or visit experiencewa.com. Fort Nisqually Living History Museum. Photo by Michael D Martin. 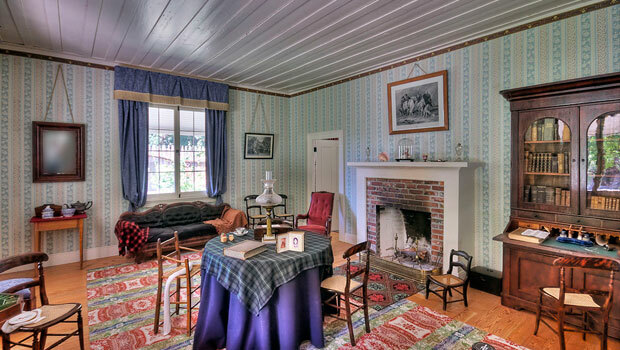 Fort Nisqually Living History Museum in Tacoma educates the public by bringing the year 1855 to life with period clothing, historical reenactments and games, tours and much more. Mount St. Helens National Volcanic Monument is a top attraction in Washington. Located around the site of the 1980 eruption, the monument allows visitors to see evidence of the eruption as well as the return of greenery and wildlife, and allows scientists to study and monitor the area. Climbing, hiking, camping, biking and cross-country skiing are available in the area. The Northwest Railway Museum is home to a working railroad and many large and small artifacts from the Northwest railroad history. Visitors can experience Native American heritage at Blake Island’s Tillicum Village. Cultural activities include a taste of traditional foods and a salmon buffet meal, a narrated cruise and a Native American-inspired show. Find more Native American heritage sites around the state at the Washington tourism website. The Space Needle is an iconic sight in Seattle and top destination for tourists. The Space Needle observation deck has a 360 degree view, allowing visitors to see the city, Puget Sound and surrounding mountains. The Future of Flight Aviation Center & Boeing Tour gives a behind-the-scenes look of airplane assembly in a working factory and a glimpse into the history of aviation design. Adventure Outdoors has local tours of the Pacific Northwest, including Olympic National Park, Vancouver, Leavenworth and Cascade Mountain. 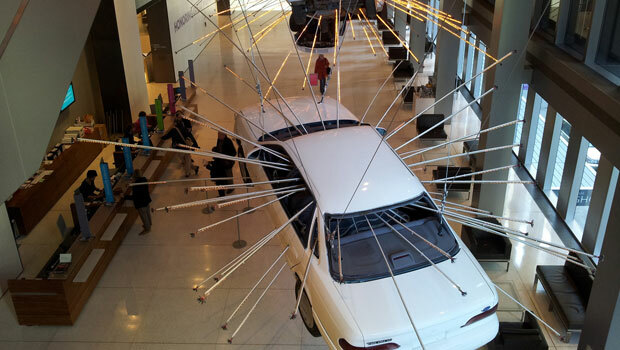 Seattle Art Museum. Photo by conxa.roda. The Burke Museum of Natural History and Culture is located on the University of Washington campus in Seattle. As the oldest museum in Washington, the Burke Museum aims to educate the public on the most significant issues of our time through exhibits, classes, events, a permanent collection and research facilities. Seattle Art Museum (SAM) has three locations – the Seattle Art Museum Downtown, the Seattle Asian Art Museum, and the Olympic Sculpture Park. Together, SAM exhibits artwork from international and local artists in a wide range of genres, from sculpture to painting to photography and from many different countries. The Northwest African American Museum in Seattle shares visual arts, music, literature and the history of African Americans in the Northwest and looks at the experience of African Americans throughout the United States. Best of the Northwest is a fine art and craft show that highlights artisans, designers and craftspeople in Seattle. For other cultural exchange activities, visit the Local Festivals section of the Washington guide for more arts and cultural events, or visit the Washington state tourism website. Crystal Mountain Resort in Snoqualmie National Forest is a popular destination for skiing and snowboarding. Scenic gondola rides to the top of Mount Rainier are also available at the resort. To find out more information on the mountain, including lift tickets, ski and snowboard lessons and accommodation options, visit the resort website. For information on all skiing and snowboarding options in Washington, visit Ski Washington to find resorts, weather conditions, ski events and more. Mount Rainier National Park, home to the Mt. Rainier volcano, provides outdoor recreation opportunities in every season. Camping, hiking, fishing, biking, ranger-guided snowshoe tours, skiing and snowboarding, sledding and snowmobiling are some examples of outdoor recreation in the park. Visitors should bring rain gear and be prepared for changeable weather! Olympic National Park contains three major ecosystems to explore, including coastal beaches, forests and mountains. Walking and hiking trails, backpacking, skiing, camping and cross-country skiing are all available in the park. Find a full list of outdoor activities in Washington state at the Experience WA tourism website. The Pacific Northwest is known for its local supply of fresh local food, including wild salmon, crab, mussels, oysters, mushrooms, Walla Walla sweet onions, caribou, elk and moose. When eating out, visitors will often find these local and seasonal foods on the menu. Farmer's markets are the perfect place to find local Washington produce and artistan-produced goods, like jams, fresh cheese and bread. Use the Washington State Farmers Market Association directory to find your closet market and get shopping! The Paperboys performing at the Triple Door in Seattle. Photo by Andi Szilagyi . Seattle Chamber Music Winter Festival in January has six nights of classical music performances, including free 30-minute shows before many of the performances. 14/48: The World’s Quickest Theater Festival is a unique event held in Seattle at the ACT Theatre in January, when 14 10-minute plays are written, planned, rehearsed and performed in 48 hours. The Seattle Improvised Music Festival is an event with musicians from around the world playing original, improvised music (music made up on the spot). 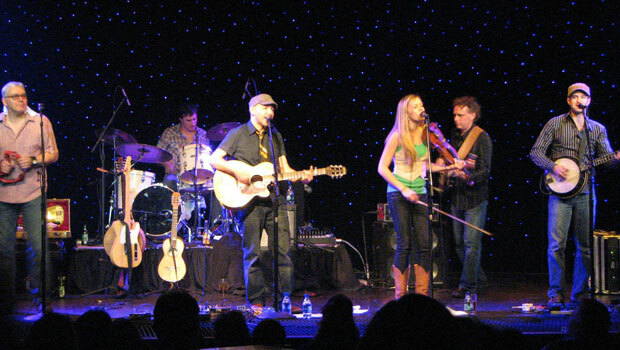 The Wintergrass Bluegrass Festival is a bluegrass and acoustic festival held in February/March in Bellevue, WA, just east of Seattle across Lake Washington. Viking Fest is a celebration of Washington's Scandinavian heritage. The May festival takes place in Poulsbo and includes traditional food, dancing, music and other cultural activities. The Sasquatch Music Festival takes place at the Gorge Amphitheatre in Quincy, WA over Memorial Day weekend in May. The event includes live comedy and concerts from many types of bands and musicians, including indie rock, alternative rock, electronic and hip-hop. Camping is also available at the festival. SoundTransit provides regional buses, light rail service and commuter rails in the Seattle area. Use the Seattle Monorail for service between Seattle Center, next to the Space Needle, and Westlake Center Mall. Washington State Ferries travel in the Seattle region and to locations as far north as the San Juan Islands. Northwestern Trailways and Greyhound provide bus transportation within Washington and, using Greyhound, to other areas of the United States. Amtrak trains travel up the west coast to Vancouver and down to Oregon, or east across the United States to Chicago via Amtrak Cascades, Coast Starlight and Empire Builder. Seattle Ski Shuttle takes passengers to and from Seattle and either Crystal Mountain or The Summit at Snoqualmie. Skiers and snowboarders looking to spend the day at a ski resort use the shuttle, so the bus only departs once in the morning from Seattle and leaves in the afternoons from the ski resorts. A list of ski shuttles to Crystal Mountain. Buses and shuttles to The Summit at Snoqualmie. During winter, heavy snow storms can close major roads and highways. Check the Washington Department of Transportation website for updates or dial 511 on your phone. Volunteermatch, Idealist and Serve are three general volunteer websites that match local organizations with volunteers in their communities. Volunteer as an Ambassador at The Summit at Snoqualmie and engage with guests about snow sports at The Summit. This volunteer position requires a specific time requirement, so be sure to read the ambassador manual before applying. Seattle Humane Society needs volunteers in their animal shelters, in the community and at events. Volunteers can work with animals, with potential pet owners, in the office or with the public, depending on availabilty and your interests. Washington State Parks look for volunteers for maintenance projects, office help and other specialized areas like historic research. For a list of volunteer opportunities in Seattle, see the volunteer page at Seattle.gov.